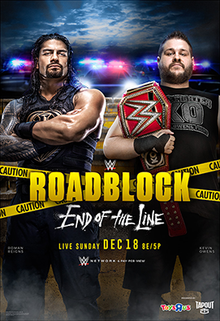 With Roadblock’s second 2016 installment, “End Of The Line” proved a fitting figurative and literal event name. The amount of wrestling Pay-Per-Views in 2016 (mostly WWE) was borderline criminal and probably deserved a police chase anyway, so we were fine with sirens, caution tape and that annoying “Different Kind Of Dynamite” song. Raw as a whole is an overexposed brand that leans on repetitive angles and drags them out to inhumane levels. We hoped headed in that Roadblock: EOTL would dissect some of the old and give us something new. – The Big Cass-Rusev match looked good on paper, but it’d be illegal (prepare for plenty of bad police/criminal puns) to not mention the storyline that brought us here. Firstly, they set this up when Cass looked to get revenge when Enzo Amore was laid out in a hotel room by Rusev, when Enzo’s whole point of being there was to hook up with a married woman he already enthusiastically exposed himself to. WWE has tendency to let Enzo get away with things simply because he’s Enzo, but that’s no excuse to tell lazy stories. The heel was the guy who defended his wife from a pervert. WWE tells us that Rusev’s the heel simply because he beat a man down in a hotel room and bashed him over the head with a flower vase. We hoped the action could make us forget all about it, but it’d practically take a Mike Bennett. That’s a TNA reference. Get it? Team SAWFT’s pre-match promo was designed to be edgy and we guess they connected there, since that was Enzo being Enzo, but Cass suffered on the mic here. Even the holiday-themed “How ya’ doin?” schtick felt old. Not much to talk about in the match though. Cass dominated early and hit the Empire Elbow, which saw a desperate Rusev try to escape through the crowd. The finish was lame, as Lana feigned an ankle injury caused by Enzo to anger her man into another attack, so he could barely beat Cass into the ring at the Referee’s 10-count. It was a cheap victory for Rusev and unfortunately, it also meant this angle would be dragged out some more. Can Rusev knock us out with a flower vase next? Of course, a rematch was announced for the next night’s Raw. Here’s our enthusiasm level. Next. – The opening video took advantage of Roadblock: EOTL being one of the more visually pleasing themes, with all the police chase stuff mentioned earlier. They fit in footage that tied into the night’s marquee bouts – the WWE Universal Championship and WWE Raw Women’s Championship matches. – The WWE Raw Tag Team Championship match between Champions Big E/Kofi Kingston and Cesaro/Sheamus felt like another tired rematch. After all, since The New Day dragged out everything Raw’s Tag Team Division could offer to break history, we could finally move on. Dare we say there was some drama to see if ND would drop the belts here, in lieu of the only other Raw tag team to gain any momentum in SheaSaro? ND always amplifies their promos before a PPV bout and it was no different here, as they put themselves over and implied sexual references that contain the word “block.” Oh, don’t make us say it for you. We loved the start as Cesaro urgently pursued Kingston to try to end it early and shock the world, but that didn’t go well. They did a cool spot where they each countered each other’s monkey flips by landing on their feet. We do think that happened one other time before though, so it wasn’t original. The challengers dictated the momentum, as Kingston sold the European uppercuts like a pro. The Champs got some advantage back when Big E hit his classic spear on Sheamus through the ropes. The match’s latter half was what people will remember for the high drama. Big E countered a Brogue Kick into a running powerbomb for a near-fall. Xavier Woods got physically involved (like past matches that proved to be the difference) again and Big E hit the Big Ending on Cesaro, but only got a two-count. Awesome transition as Cesaro hit a Frankensteiner and rolled into a Big Swing/Sharpshooter spot. Big E broke the pinfall at the last second when Cesaro hit a modified Neutralizer. The “third man trickery” angle brought us so many false finishes, but the challengers saw it through. Woods sacrificed himself to a Brogue Kick and Sheamus kicked out of the SOS. The finish was actually excellent, as Cesaro fooled Kingston into thinking he was the legal man as he purposely missed a Sheamus tag. That set up Kingston to hit Trouble In Paradise on Cesaro, which allowed Sheamus to roll him up and get a three-count. Bam. New Champions. The world can finally breathe. Sure, they did the “yay/boo” routine again as they celebrated with the belts, but Cesaro/Sheamus as Champs makes us feel like the Division can start to be taken seriously. Will they have ND’s rematch clause the next night on Raw or drag it out for Royal Rumble? – The WWE Universal Champion Kevin Owens-Chris Jericho backstage segment was nicely placed, as Owens was asked if the ND’s loss would have any effect on him and he went off on the Interviewer lady, a longtime KO tradition. We got more Jeri-KO tension, as Jericho turned down Owens’ holiday scarf gift. – The Sami Zayn-Braun Strowman match with the stipulation that Zayn needed to last 10 minutes with the monster stemmed from the decent story headed in that Zayn’s obsession to overtake Strowman ate away at him to the point where they even teased a trade to SmackDown Live. We also got Zayn’s best promo to date when he went off on General Manager Mick Foley. The match was good and bad for different reasons. On the surface, we liked that Zayn’s underdog spirit was enhanced at the start and very end. The bad parts involved the idea that Strowman already had him defeated and purposely toyed with him and stopped the Referee’s counts. The “white towel” angle with Foley felt unnecessary, but did get the crowd invested when Zayn tossed it away into the crowd. Strowman looked a little foolish as his offense towards the end was to simply run into Zayn, but missed three times. The Helluva Kick at the end looked to have Zayn on his way to actually getting a pinfall win, but the time limit stopped there. The Referee awarded Zayn the winner for simply surviving. In retaliation, Strowman simply looked dejected/exhausted while Zayn scrambled away. What was to stop Strowman from simply going out there and annihilating Zayn for making him look like an idiot? We know there’s more to this story and maybe it’ll play out on Raw, but they’ll need to do a lot. At least Zayn got a “Win” without Strowman actually losing. – The Seth Rollins-Jericho match was the show’s best traditional one-on-one bout. The story was muffled a little with the Jeri-KO drama, since Rollins’ whole beef with Jericho was because he interfered in his three Title shots, all to help Owens at the time. Now that Jericho was seemingly done with Owens, what point did he have to prove to Rollins? We guess you could bring up the parking lot assault that culminated with a Pedigree on the roof of a car, but there needs to be more than that. Now that we forget that, this was a good chance to see two solid in-ring performers do what they do best. Luckily, that’s what we received from bell to bell. Jericho played off the fans brilliantly upon his entrance when he sneered at the first three rows of fans on the hard camera side who had “Stupid Idiots” signs with Jericho’s picture on it. The crowd was evenly split and the little factoid that this was Jericho’s 140th PPV match by Commentator Michael Cole put him over as the veteran. Back-and-forth action was what it was all about. Some highlights included Rollins’ high knee off the apron and Jericho’s signature leaping dropkick as Rollins attempted a springboard maneuver. They had each other well-scouted, as Rollins kicked his way out of the Walls Of Jericho and pushed Jericho over the top rope on a Lionsault attempt. Jericho took advantage of a missed Rollins frog splash and hit the Lionsault, but got a two-count. A swift exchange of moves as Jericho locked in the WOJ and Rollins valiantly slid to the ropes. Rollins hit the frog splash again. The finish made sense as we saw Owens come out assumedly to help Jericho and it backfired, when Jericho was distracted and ended up Pedigreed when he tried to hit the Codebreaker. Rollins gets his revenge win and Jeri-KO certainly looks done. – The WWE Cruiserweight Championship Triple-Threat match between Brian Kendrick, Champion Rich Swann and TJ Perkins with Austin Aries on commentary had one of the show’s better builds. With 205 Live’s help, we had more stories for this trio. Kendrick was the wily veteran eager to paint tension upon the “good friends” of Perkins and Swann. It worked to an extent and all led to this. Unfortunately, the crowd was dead throughout and despite the flashy moves, it was hard to be enthusiastic. Literally the only worthy highlight was Swann’s double huracanrana spot. There was also an overuse of submissions, which brought down the energy. Perkins also looked like an idiot when he released Swann from his kneebar when he got to the ropes. Triple-Threats have no disqualifications. After a double superkick to Kendrick, Swann pinned Perkins with his heel kick to retain. The match’s talking point came with Neville’s sudden return and heel turn as he approached Swann with a smile and savagely ambushed him. He did the same to Perkins and avoided Kendrick throughout. With an angry face and facial hair, a heel Neville will be just what the Cruiserweight Division could use. What was telling was that the crowd chanted, “Thank you, Neville” so Creative needs to work harder to make the babyfaces ones worth cheering for. Neville’s now apparently Sheamus circa 2015. – The backstage segment with Owens’ apology outside Jericho’s locked locker room was more advancement of their bickering. Owens spilled his heart out and declared his feelings were hurt. The crowd reacted to the “Put my name at the top of the list” comment but nothing more after that. We see why they did this though. – The WWE Raw Women’s Championship 30-Minute Iron Man match between Champion Sasha Banks and Charlotte Flair was most fit for the “End Of The Line” phrase. The superb video package played again, as it focused on the competition aspect that the two brought the best out of each other and the belt they fought over. Technical difficulties messed it up though. The first few minutes proved a stalemate where one couldn’t get an advantage over the other. Banks applied a strait jacket submission with added extension. That looked painful. Banks hit a suicide dive crossbody onto Charlotte. Charlotte countered as she tripped Banks on the apron and her face landed into the steel steps. The first fall was already clocked in at 20 minutes, so we wondered if they would flirt with a tie to the end. Couldn’t have it any other way. Those hopes dashed when Charlotte got the first fall with her second Natural Selection, this time from the top rope. Charlotte upped her confidence as she bragged to Banks, before she was rolled up to instantly tie it. Charlotte missed a moonsault and Banks followed up with the Bank Statement and rolled back into the center of the ring when Charlotte neared the ropes. Charlotte tapped to give Banks the 2-1 lead. From this point, the match became excellent. The two exchanged slaps and chops, before Charlotte exploited a chance to work over Banks’ knee. The last minutes were great as Charlotte locked in the Figure Eight and held on ferociously. We almost didn’t want this to end. We didn’t like that Banks tapped with three seconds to go in the match to tie it again, since it looked too melodramatic, but Commentary backed it up when they claimed that Banks’ ankle could’ve snapped. We were surprised that the Referee was left with the decision to make it a sudden death overtime and not someone like say, Foley or Commissioner Stephanie McMahon to get the crowd excited. The good thing about this is that it could literally go either way. The two fought for the belt six times and all times, the Champion lost. Banks became busted open from the nose/mouth and the blood helped enhance the drama. Charlotte reversed the Bank Statement into the Figure Four and fought to stretch it into the Figure Eight. After she locked it in and 15 seconds after, Banks tapped to crown a new Champion and appropriately end the feud. No rematch clause here, but that’s what it was all about. We’re eager to see what the Women’s Division will look like now that Banks-Charlotte aren’t entangled over the belt. Either way, that was a bonafide show stealer. Keep in mind that Charlotte was now 15-0 on PPV. – The WWE Universal Championship main event match between Champion Owens and WWE United States Champion Roman Reigns was a PPV-worthy contest, but one that most probably didn’t want to see. This was a tease to see Reigns close out 2016 on top as a double Champion. Reigns did look smart to cash in on the Jeri-KO drama as he earned the opportunity when he defeated Owens clean without Jericho’s involvement. With Jeri-KO seemingly done, this looked to be another true one-on-one match, but we expected some shenanigans towards the end. Things began with high impact drama, but slowed down immensely when Owens got the advantage. After we nearly fell asleep, things appropriately picked up when Owens countered a Superman Punch with a DDT. Reigns hit a Superman Punch for a near-fall when Owens ran for a Cannonball. Reigns hit a SP with Owens on the top rope, only for the Champ to hit his falling package suplex. It was interesting that Owens wouldn’t opt for a countout win when he had Reigns laid out on the announce table at four, but he went for a frog splash announce table spot. Thankfully, he hit it twice when the table didn’t give on the first. Reigns barely beat the 10-count but fell right into a top rope frog splash for a near-fall. He also put his foot on the ropes after a Pop-Up Powerbomb. Now, let’s get to the flimsy finish. Oh, god. This was meant for “shock value” that the best friends were back together again, but the way we got there made no sense. Firstly, Jericho came down when both men were laid out (Reigns hit a spear when Owens tried to get himself DQ’d) and found himself in the middle of the ring, eager to do something. When it looked like he would go for Reigns, he hit Owens with a Codebreaker. Face turn, right? Wrong. Reigns was disqualified to keep the belt on Owens, but that wouldn’t had mattered anyway since Owens was Champ headed in. They had teased Jericho hitting Owens with a Codebreaker, so to get it over the way they wanted it to, Jericho should’ve hit Reigns with it instead. Owens still would’ve retained the Title and we would’ve instantly knew right there the friendship was back. The post-match revenge angle where Rollins/Reigns did separate announce table powerbombs was fine, but this felt like it was merely building to a Raw match. What’s the point? Posted on March 4, 2017, in WWE and tagged Austin Aries, Big Cass, Big E, Braun Strowman, Brian Kendrick, Byron Saxton, Cesaro, Charlotte, Chris Jericho, Corey Graves, Enzo Amore, Kevin Owens, Kofi Kingston, Lana, Michael Cole, Mick Foley, Neville, Raw, Rich Swann, Roadblock: End Of The Line, Roman Reigns, Rusev, Sami Zayn, Sasha Banks, Seth Rollins, Sheamus, TJ Perkins, Xavier Woods. Bookmark the permalink. Leave a comment.